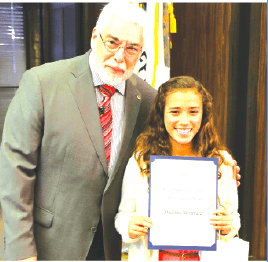 La Mirada Mayor Steve De Ruse presents 7th grade student Madeline Hernandez of St. Paul of the Cross with a certificate of recognition for winning 1st Place in her age group for the annual “Love a Tree” Poster Contest. Winners of the City of La Mirada’s annual “Love a Tree” Poster Contest have been announced. Posters were judged for creativity and originality by the La Mirada Youth Council and the Community Services Commission. Winners and their schools include: Levi Carrigan Heights Christian Elementary Pre-Kindergarten; Destiny Caballero Escalona Elementary Kindergarten; Monal Walvekar Eastwood Elementary 1st Grade; Sophia Sycharean Escalona Elementary 2nd Grade; Brielle Han Eastwood Elementary 3rd Grade; Gabriela Baides Beatitudes of Our Lord 4th Grade; Isaiah Montoya Escalona Elementary 5th Grade; Eryn Cyia Tandoc Benton Middle School 6th Grade; Madeline Hernandez St. Paul of the Cross 7th Grade; Albert Vega Benton Middle School 8th Grade. inning posters are on display in the City Hall library, and winners were recognized at Tuesday’s City Council meeting.